Mitsubishi designers and "Dr. Evo" craft solution for "Ultimate L.A. Machine Design Challenge"
January 5, 2005 -- Los Angeles -- Mitsubishi Motors North America, Inc. (MMNA) today unveiled a futuristic design concept at the L.A. Auto Show that is the perfect Los Angeles-area vehicle. Portrayed in the form of a special two-dimensional "Ultimate L.A. Machine" sketch, the design concept is entered as part of the show's first annual Design Challenge. "Los Angeles is one of the few places where within a one hour drive you can go surfing at the beach, hiking in the desert, snowboarding in the mountains, and still make it out for a night on the town in the infamous L.A. club scene," said Jon Hull, designer in the Cypress, Calif. studio of Mitsubishi Design America. "So we decided to design a vehicle that can take advantage of all that L.A. has to offer." 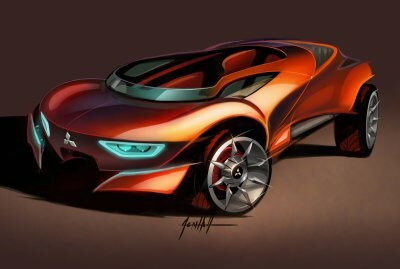 The name of Mitsubishi Motors' design is "Goku shin ka," which translated from Japanese means "The Ultimate Evolution." It builds upon the success of Mitsubishi Motors' Lancer Evolution vehicle line and combines the best attributes of several different vehicles. It blends the components of a convertible to take advantage of the L.A. weather, the sexiness of a sports car, the higher ride of an SUV for better road visibility, the versatility of a pickup truck to carry bikes and surfboards, and rides on "bling" 22s that truly embody the L.A. attitude. Packaged in the form of a comic book storyboard featuring "Dr. Evo" as the main character, the Japanese anime-inspired drawing pays tribute to both Mitsubishi Motors' Japanese roots as well as L.A.'s entertainment background.